Despite the increased number of imported figures that make their way to the UK nowadays there are still some that never seem to get across to us. The ones that don't make it are usually the smaller figures, where the import costs push the price up too much for them to seem worth the money. It's a shame as many of these smaller figures cover characters you can't get in the more expensive ranges, and have an appeal all of their own. 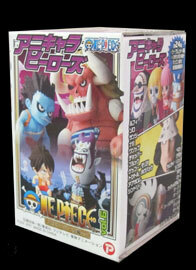 This One Piece Ani Chara Heroes Mini Big Head Figure range is a case in point. 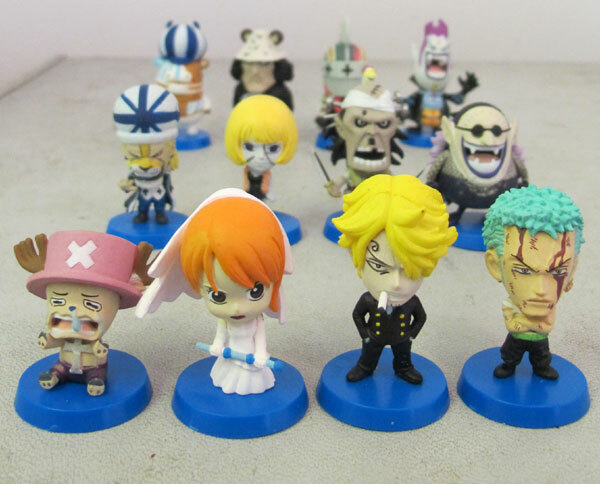 Now on its sixth series this range contains 25 figures drawn from the manga's Thriller Bark story arc, whilst previous ranges have covered the Water Seven, Enies Lobby, Skypiea, Alabasta and Grand Line entry arcs. The range of characters covered by the range is staggering, and many have next to no chance of ever being released as a figure in another range. order to assemble him. 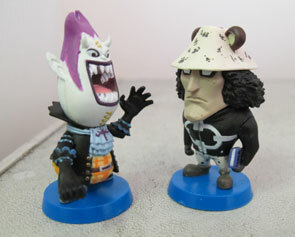 Each figure stands about 4-5cm (1.5-2") tall, and comes with a plain blue base to stand them on. The figures are all depicted in a 'chibi' style (see glossary) and in recognisable poses and outfits from the Thriller Bark storyline from the One Piece manga and anime, with Nami in a wedding dress from her sham wedding, Sanji enraged after discovering the power of one of his enemies and Zolo severely wounded following his face off with Kuma. Several of the characters are specific to the Thriller Bark storyline and don't appear outside of it, making this range an excellent record of a particular part of the manga. The sculpt of each figure is pretty good, with plenty of detail and character imbued into each one. It's not the best you can get, but for the price and size it's much better than you may expect. The design of each figure is excellent too, in fact the only thing that lets it down in the painting. The painting is not terrible, but it's strangely erratic. One some figures - such as Zolo - the level of facial detail is stunning, with his grim expression and wounds picked out perfectly with neat, clean painting which really brings the figure to life. However, on others - such as principle villain Gekko Moria - the painting is sloppy, with colour bleed on the clothing detail. The same is true on some of the other characters, but it mainly seems to be an issue on the non-human ones. There are also moulding lines visible on most of the figures, which is a common occurrence and is as noticeable as always. and size they're pretty damn good, and include a number of characters that have not been released in any other figure range. For One Piece fanatics these figures are a must have, and for everyone else they're still pretty cute and full of character. They may not be the biggest but they're well worth picking up if you can get hold of them - if any companies are reading please import them!! Each figure comes with a plain blue base and a leaflet showing all of the figures in the range. Elsewhere you have two halves of Oars which combine to make a single figure, and the Duvall figure can be taken off its base and put on top of the Motobaro figure, letting him ride his bison steed. The secret figure is of Duvall without his mask, and the range also includes a secret version of Oars made of clear purple plastic. Not bad, but you have to get them all to really get all the extras.